This past weekend my daughter Tory’s Rampage softball team played in the Delaware Invitational Tournament. It’s a big-time college-showcase tournament. In the blistering heat, scores of teams played on well-maintained fields watched by many, many college coaches. We thought it was the best softball showcase we had attended this summer in terms of exposure to college coaches. When the games are done for the day, everyone troops back to the team hotel to shower and eat. We typically have ravenously hungry teenage girls to feed. They want food and plenty of it! Friday night we all went to the Texas Roadhouse restaurant. Years ago, our family had eaten at one in Georgia and I had fond memories of our experience so I was looking forward to the meal. This is what you see on the floor of the Texas Roadhouse! Fair Warning: This restaurant is not for the peanut allergy crowd. 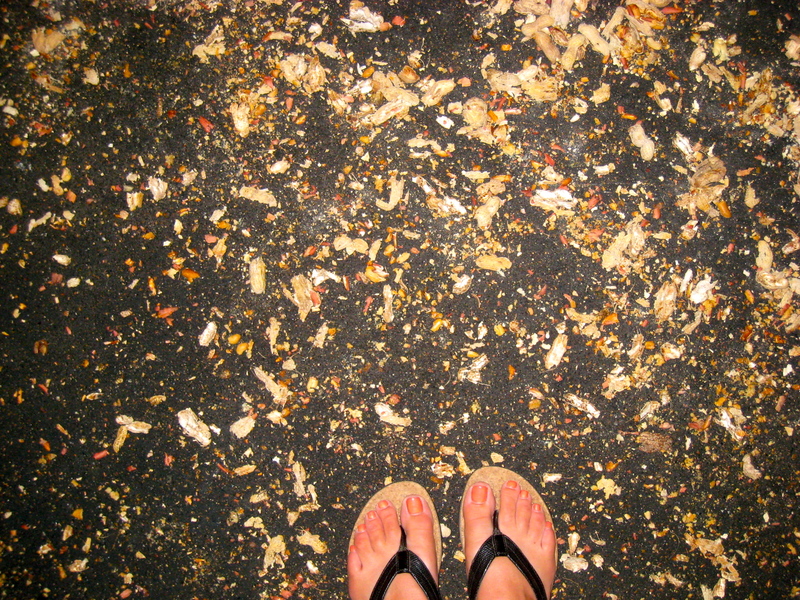 From the second you walk in the front door you are crunching peanut shells under foot. 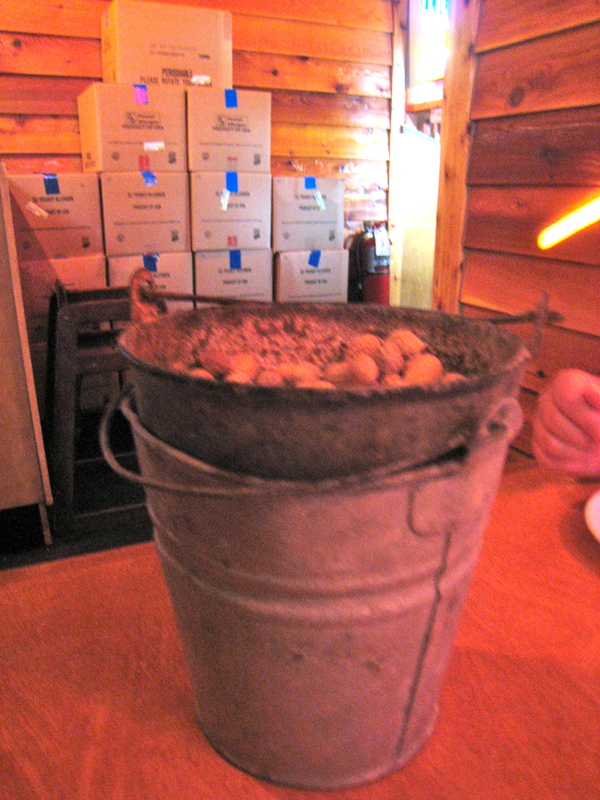 The free appetizer is peel-and-eat whole roasted peanuts. Crack’em open, toss the peanuts in your mouth and the shells on the floor. It’s that simple. And that much fun! Yum! I had a delightful time sitting with some of the parents and getting to know them better. Ashley’s mom Rhonda started out by carefully examining the specialty drinks menu. She and Jenna’s mom Betty talked about the merits of each of the drink choices for quite a few minutes. Then Rhonda asked our waiter what he would recommend. Rhonda and Betty ordered Jamaican Cowboys. 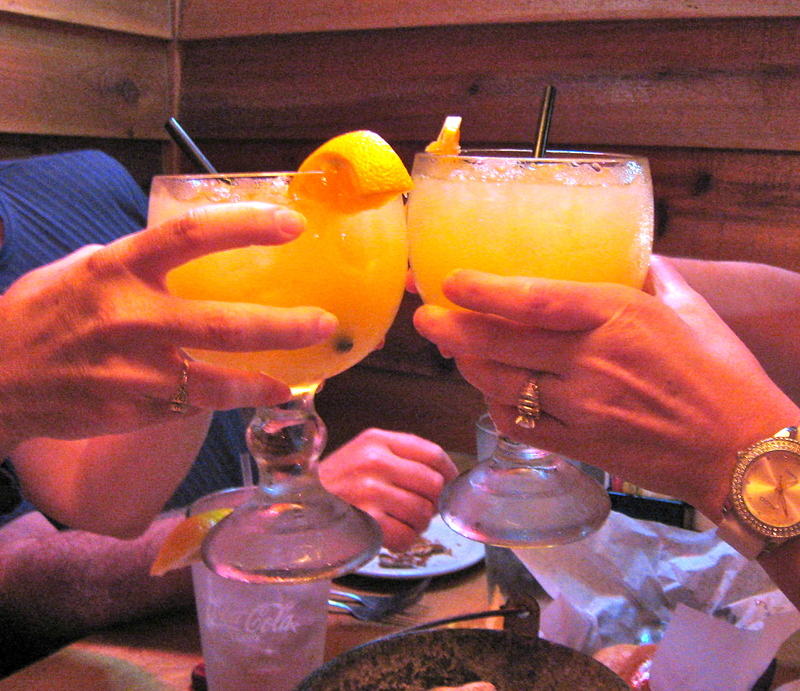 When the drink arrived it took both women two hands to lift their drinks because they were THAT BIG. What you see are two Jamaican Cowboys. That's Rhonda on the left and Betty on the right! Lindsey’s mom Louise, having heard from her office assistant that fried pickles are divine, saw them on the menu and ordered a basket. I’d never heard of fried pickles (although I have heard of and eaten fried twinkies while visiting my girlfriend Carole in Maine!) so when she offered me a taste, I quickly popped a couple in my mouth. Good grief! 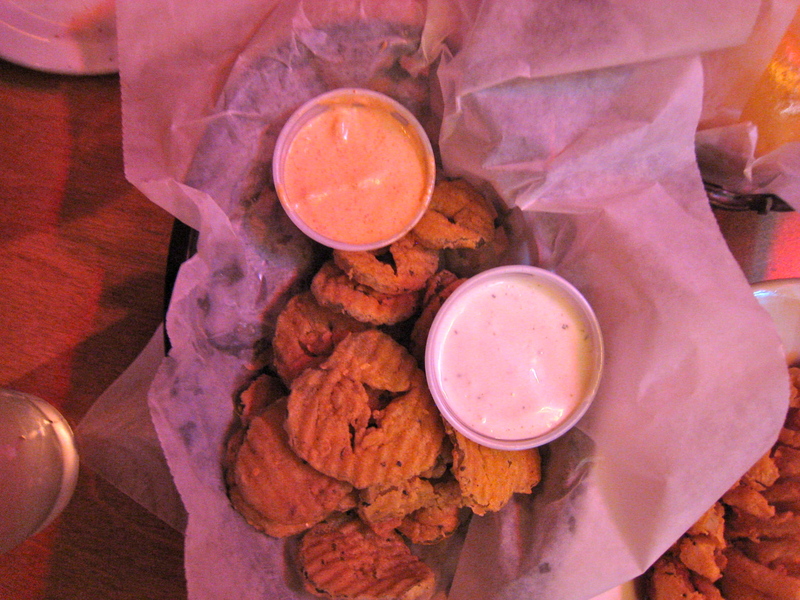 The combination of the batter-dipped salty pickles and two dipping sauces made my mouth happy. Awesome salty crunchy deep-fried pickle slices with dipping sauces! 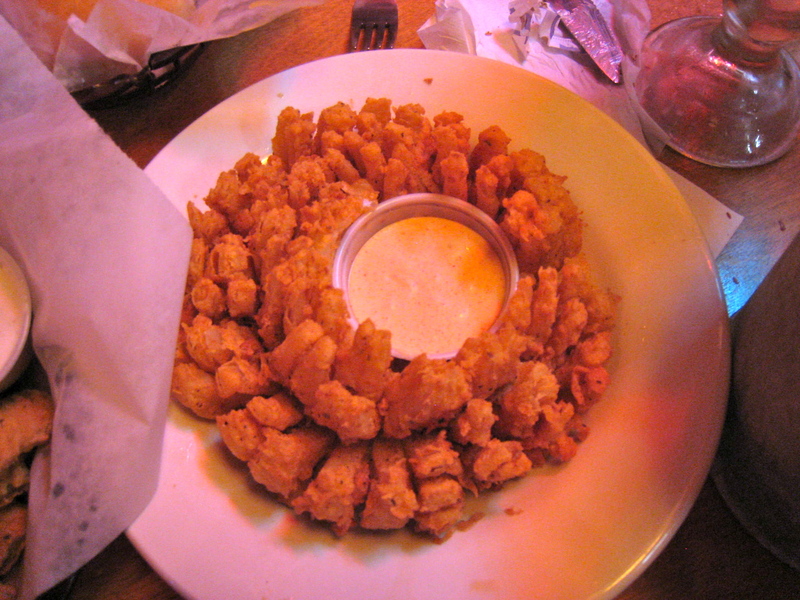 Betty ordered a couple of baby blossoms – small batter-dipped deep-fried onions. Those little darlings will make any onion lover’s mouth happy. Trust me on this one! What's not to like about a batter-dipped deep-fried onion?? For my meal I ordered skewers of spice-dusted shrimp over seasoned rice. And I chose broccoli and green beans for my two sides. My meal was fine, but I have to admit that the highlight of my dining experience was the deep-fried pickles (thanks again, Louise!!). Others at the table ordered whole slabs of what they said were fall-off-the-bone terrific ribs, steaks of different sizes and kinds, sweet potatoes, divine looking tossed salads with home-made dressings and more. We ate until we could eat no more. Then our waiter brought out the take-home boxes! We left still trying to figure out how we might abscond with one of the many boxes of peanuts stacked near the front door! Look at all the boxes of peanuts stacked in the background near the main entrance!